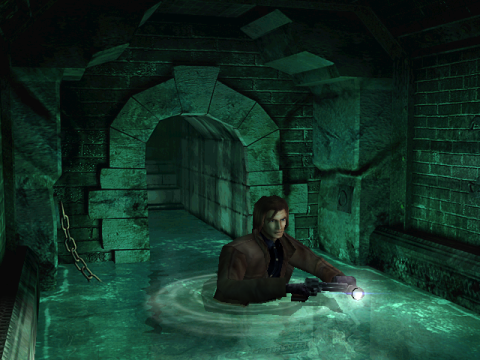 After a long hiatus, Edward Carnby was awaken from his coma in 2001 to try and take back his rightful place in a genre now vastly in the hands of Japanese companies. The game wasn’t developed by Infogrames itself, however, but sourced out to Darkworks, a small Parisian studio that later became known for Cold Fear and the troubled I Am Alive. The project actually met with massive coverage in France, and the budget was gigantic for the time. The plot was written by Xavier Dorrison, famous bande dessinée storyteller, while the monsters were designed by Claire Wendling, one of the best BD artists around. Two majors French actors were also added to voice the two characters: Edward Carnby is played by Guillaume Canet (the husband of Marion Cotillard) and Aline Cedrac by Emma DeCaunes (she also voiced Jade in Beyond Good & Evil). 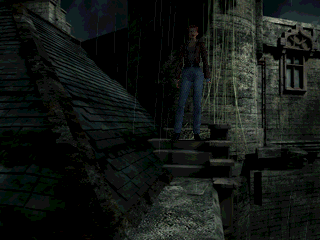 The character of Edward Carnby got a complete revamp, though: According to retconned franchise lore, every forty years a man called Edward Carnby is born to fight darkness and protect the world against evil. The Legend of Zelda much? The new 21st century Carnby discovers that his best friend and mentor, Richard Fiske, died in very strange circumstances. Just before his demise, Fiske told Carnby about his investigation of Native American ruins in a god-forsaken place called Shadow Island. Equipped with his loyal double barelled revolver and a torch, Carnby sets out to face the unknown on his own. Unfortunately for him, though, he is affiliate with the made-up government agency Bureau 713, which sees him as a “lose cannon,” and sets him up with a partner, the archaeologist Aline Cedrac. As one would expect things go bad, the plane crashes and the two protagonists end up separated. The New Nightmare brings back two selectable player characters, but like in Resident Evil 2, the choice determines the starting point and progression of the adventure. Edward and Aline meet up and exchange their findings at certain points during the story, but for the most time they’re out on their own investigations. Like Doctor Who, the fearless paranormal investigator is reborn in a new, younger avatar. Dropping the blue suit and moustache for a trendy trenchcoat and long hair, Carnby is more action-focused than his partner. He possesses a double-barrel revolver from the beginning, and usually gets the most destructive weapons. He starts outside the mansion, and has to fight his way trough the gardens and sewers before entering the castle. His primary goal is to catch the master of Shadow Island, Professor Alan Morton, whom he beliefs to be Fiske’s killer. A young and dynamic archaeologist with daddy issues. She crashes on the roof of the manor, with no weapons whatsoever. Her path is mostly focused on puzzles. Often her flashlight is her only means of defence against the shadow creatures. She also has to deal with an annoying Nemesis-like recurring boss through the game. She is also led to believe that Obed Morton, the younger brother in the manor, is her father. Unusually for the series, the heroes also get to interact with a proper supporting cast. There’s the good old Native American shaman Edenshaw, the last of his tribe and tutor of the two Morton brothers, so obviously not a very good one. He tries to repair the errors of his wayward pupils by helping Edward and Aline to stop Shadow Island’s madness. The Morton brothers couldn’t be any more different: Alan is a mad scientist who studies the darkness living under Shadow Island, whereas Obed is a famous archaeologist and Abkanis tribe expert. With the help of Edenshaw, he translated the ancient Abkanis tablets around which much of the plot revolves. He spends most of his time locked inside the mansion. Aline first encounters the Mortons’ bedridden mother, and later an ancient Indian spirit trapped in a mirror. Mixing together a mumbo-jumbo of classic native American mythology and the House of Usher syndrome, the plot does sound promising, if only its execution was successful. Unfortunately the dialog spoils most of it. Having good actors without good voice direction is pretty much a recipe for disaster. The incessant chat between the two protagonists is awkward at best and extremely annoying at worse, and plot expositions are usually thrown in between two inane sentences. 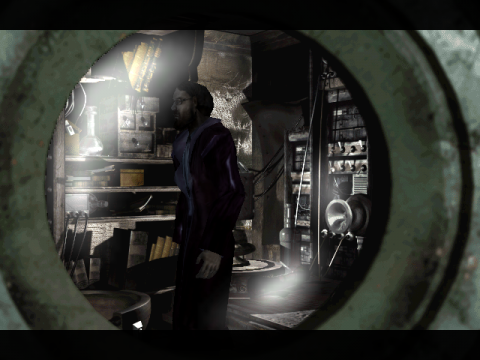 On the other hand, the crossing of the two scenarios is really well done, and by replaying the game one gets a clearer picture on the whys & wherefores of the two protagonists. Obed appears to be in trouble. 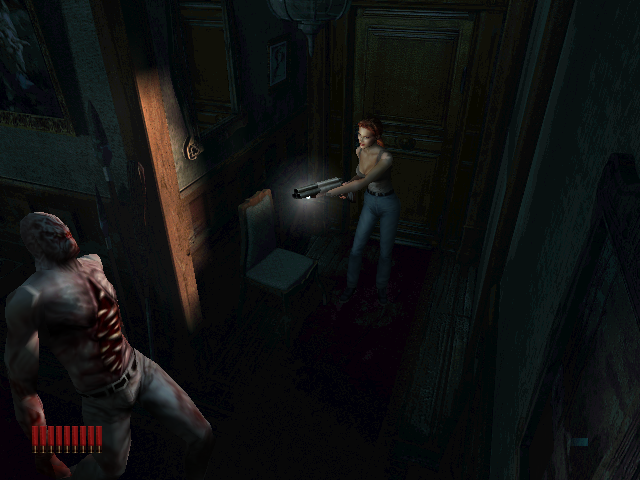 Although the series used to be the inspiration for Capcom’ survival horror series, The New Nightmare feels like a typical Resident Evil clone, with fixed camera angles, ammo management, limited saves, absurd keys and overwhelming enemies. Even series staples, like the ability to place items anywhere, are gone. It’s not like that is needed, anyway, as there’s no limitation to the inventory anymore. Also, many of the latter are pure bullet-sponges: They can absorb tons of projectiles, to the point where it becomes silly, and of course they respawn all the time. Going the wrong way or wandering a bit too much in the manor becomes equal to suicide. But Resident Evil is not the only Alone in the Dark descendant The New Nightmare owes to – the game runs on a variation of Terminal Reality’s Nocturne engine. 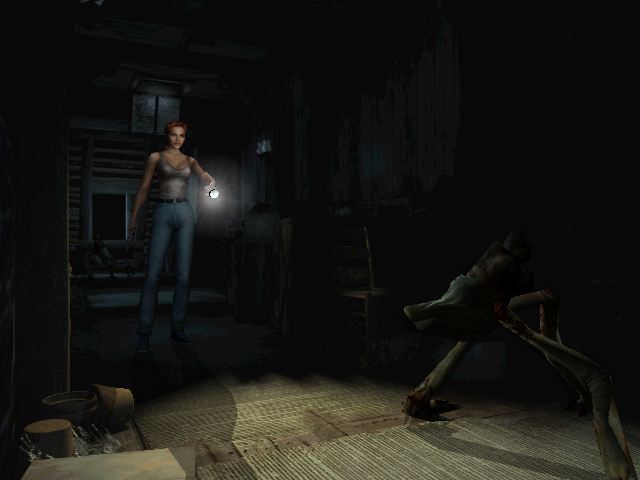 The most advertised feature of that game was the believable handling of lighting and shadows on the 2D backgrounds, and The New Nightmare puts it to formidable use. 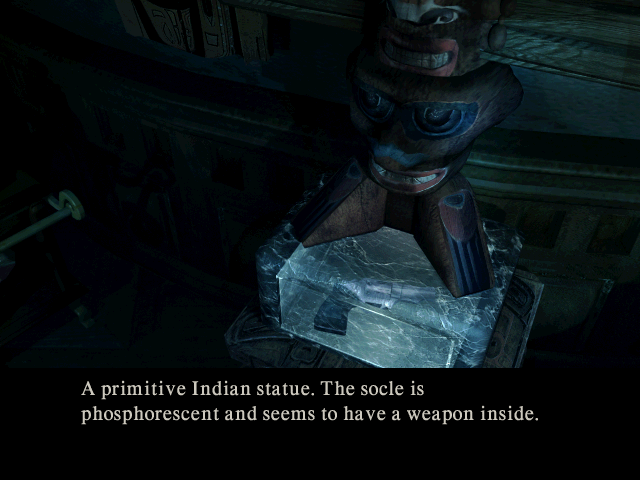 Many areas are covered in darkness, making it impossible to see properly without turning on the flashlight. But that’s not enough, the effect is directly interwoven with game mechanics, as certain enemies are killed by light, or at least fear it. 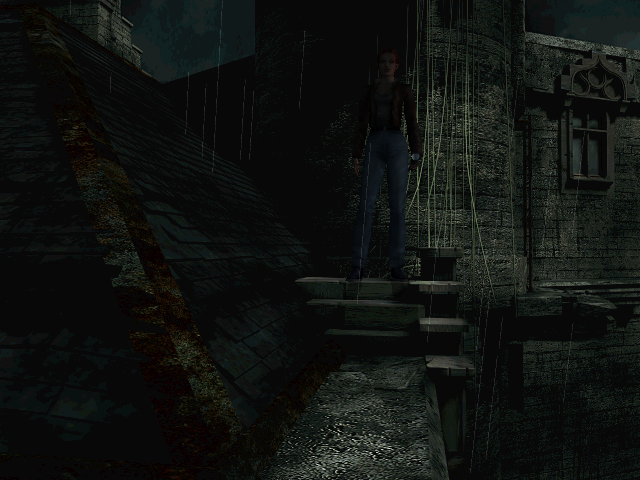 The rest of the graphics is also nice, displaying really scary environments with a 2D art direction that formidably accentuates the mastery in lighting. 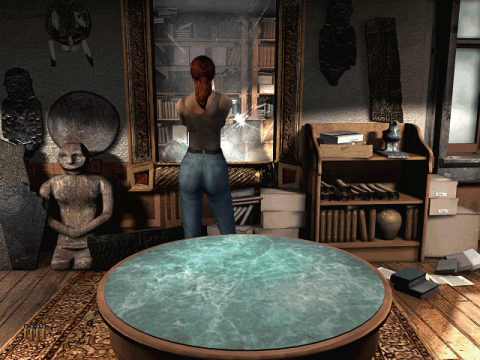 The characters blend in with them better than in most games with this kind of technology, although keen eyes still spot clipping errors here and there. The music is nothing short of thrilling. Composed by French band Low Distortion Unit, the music is a direct tribute to NIN & Trent Reznor’s work on Quake, but is also strong in the more quiet moments. It’s a fantastic soundtrack and really helps to give a new direction to the series. 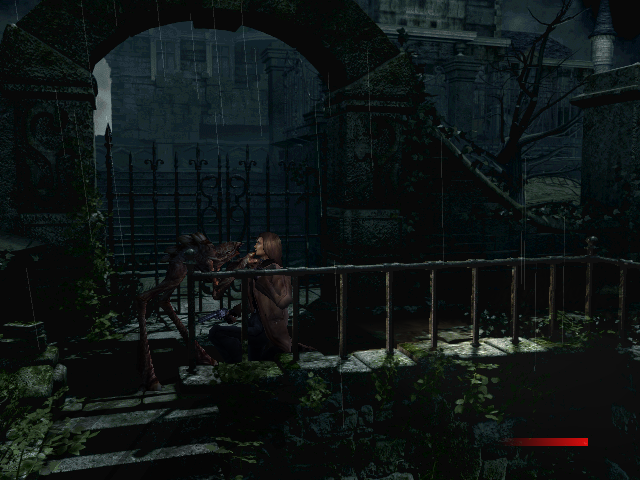 The groans of monsters and other sound effects are creepier than ever, too. 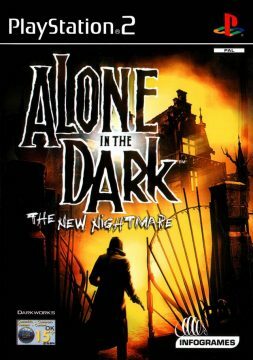 Ironically, though The New Nightmare tries so hard to imitate the Resident Evil experience that it almost completely sacrifices what made Alone in the Dark special, namely the exploration, a sense of helplessness and being truly alone, and a bit of general wackiness. 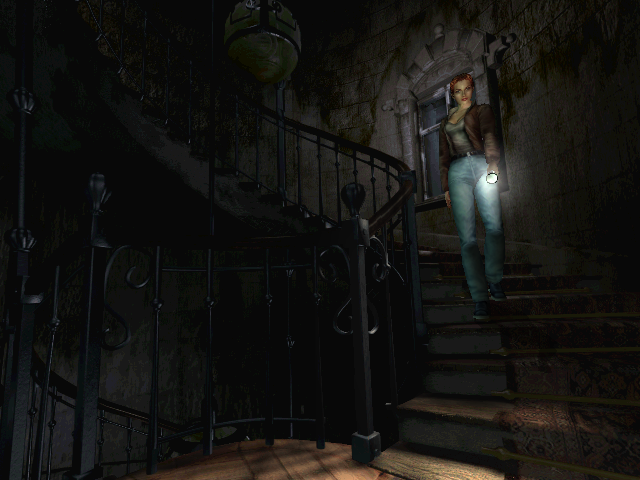 Yes, it is a good Resident Evil clone, but leaves the series standing pretty much as a shadow of its former self. 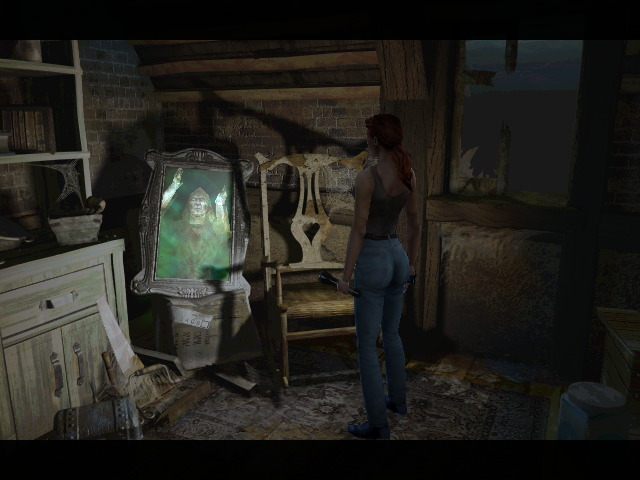 It’s also full of glitches, even more so than the often less-than-perfectly tested classic games: Monsters that just disappear into thin air after a cutscene, crashes and walls the player can run into and get stuck are no rarity. 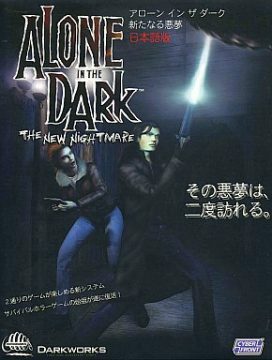 Contrary to its ancestors, this new AitD was conceived from the get-go as a multiplatform title, brought to all available consoles at the time. Most of them are pretty much the same, although the lighting in the Windows version might be a wee bit superior. Other than the console versions, it also allows to switch to higher resolutions than 640×480, but only the characters get anything out of it, making them contrast more against the standard resolution backgrounds. Besides the PS2, there was also a port for the old PlayStation, which was still going strong at the time (in fact, this was the version that came out first, together with the handheld adaption seen below). Of course, this one features downsampled graphics. The backgrounds suffer surprisingly little from the treatment, but the characters look really bad compared to the other versions. 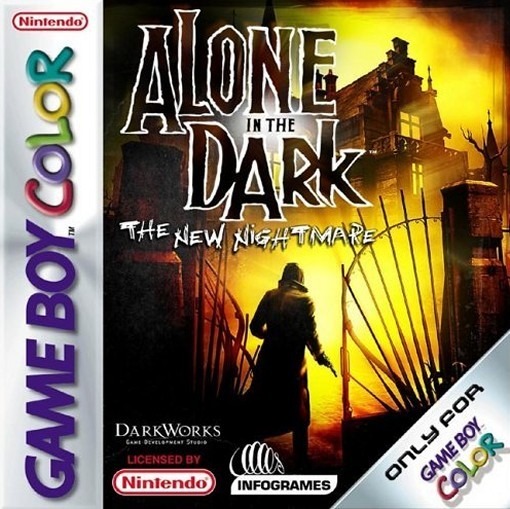 Although Darkworks tried to the best of their abilities to properly bring The New Nightmare to the Game Boy Color, there just had to be compromises. Gone are the two selectable characters (you just play as Carnby), the FMVs are replaced by static images, and the adventure is a whole lot shorter; it can easily be completed in about an hour. And of course the main poster feature of The New Nightmare, the incorporation of light sources with the gameplay, didn’t make the cut. The game is divided in two parts, a la Parasite Eve: an adventure phase featuring crassly downsampled backgrounds from the big brother, where the player gets to roam freely on Shadow Island and solve puzzles, and a separate combat mode on pixel art backgrounds, which works very arcade-like. The backgrounds actually survived the translation to pocket format fairly decently, although they clash with the very different, simpler style of the combat scenes. The player character also never seems to merge with the background properly, making his movements seem unnatural and floaty.